Navy recruiting ads are something of a running joke in the fleet, especially among junior enlisted personnel. The commercials invariably show sailors performing the most exciting and extraordinary tasks they perform throughout the world every day. Often those commercials are backdropped by a soundtrack of either shredding guitar or Saving Private Ryan-esque rolling snare drums and blaring trumpets. But what the commercials don’t show are the rather mundane and monotonous tasks sailors perform on a day-to-day basis, even though those tasks are every bit as vital as oft-used video clips of SEALs hitting the beach or DDGs test-firing SM3s. They never show some poor operations specialist freezing his tail off, roaming the decks of his ship at 0230 while on M-14 rover watch in the dead of winter. They never show the hull maintenance technician cleaning up a foul CHT overflow in the operations department’s berthing head. Nor do they show line handlers being sprayed down by JP5 fuel when the probe unseats during an underway replenishment. No, the commercials are strangely silent on the finer points of Navy living. 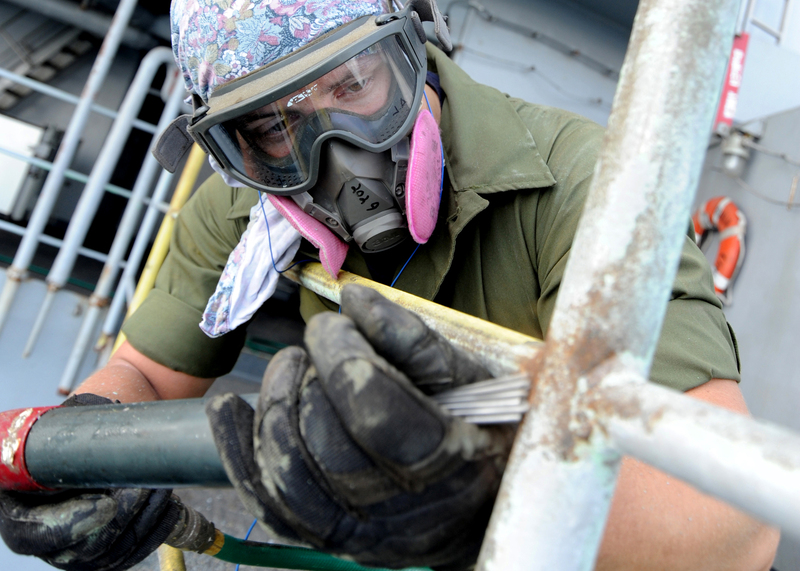 But the service, to its credit, posted this picture on its website that shows a deck seaman needle-gunning a lifeline. Needle guns are a crucial piece of equipment in the process of chipping and painting, a function junior sailors become well-acquainted with during their early careers. Cheer up, Seaman Dagan Alexander. Study hard and make rate, then you can pass down this fine Navy tradition to your underlings when you’re a second class. Wait until you have 100 E-6 and below trying to maintain and operate the 600 ft long, 85 ft wide, 14,000 ton Zumwalt class DDG. Navy recruiting of 1978 Port of Call series and It’s not just a job, it’s an adventure commercials became on Saturday Night Live, it’s not just a job, it’s $96.78 a week. The fake commercial was so much closer to everyday navy life. I saw the original broadcast of this while onboard the USS Nimitz sitting at Pier 12 in Norfolk. There was brief moment of silence as it ended, then I believe the entire ship if not all of NOB roared as one. Wow since 1999 to 2003 what an adventure aboard the uss nassau lha-4..yes navy life is crazy…nothing close of what is in recruting commercials…no is something that makes some sailors go awall/ yep…cleaning mopping floors,working in the galley, cleaning the berthings,,laundry details,ohhhh let’s not forget the working parties/ for ships storages of food ..and then we have those special days where the master chief gets to have fun. With the crew cleaning the entire ship…all you salts know what I am talking about…..go navy go…gets ur brooms and dust pans….have fun navy life sure sure sure is an adventure…..